Calls for fresh inquiries into the Dunblane shootings have been rejected by a Holyrood committee. Three separate petitions relating to the massacre were discussed at the Scottish Parliament. But MSPs said the families of those killed at the town's primary school 10 years ago were looking for "dignity" rather than further investigations. 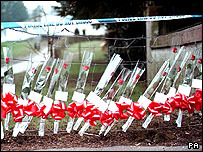 Sixteen children and their teacher were killed by gunman Thomas Hamilton on 13 March, 1996, before he shot himself. Holyrood's public petitions committee considered a submission by Sandra Uttley, the former partner of Mick North, whose daughter Sophie was one of Hamilton's young victims. Miss Uttley, who has now separated from Dr North and lives in Cowbar, near Whitby, called on MSPs to urge the Scottish Executive to hold a new inquiry. There was a similar demand from William Burns, of South Queensferry on the outskirts of Edinburgh. Doreen Hagger, from Aberdeen, wanted an investigation into Hamilton's dealings with Central Scotland Police. Committee convener Michael McMahon said that the families themselves had not called for a new inquiry during the publicity which surrounded the 10th anniversary of the shootings. The Labour MSP said: "I became concerned that these petitions were not being helpful to the parents. "We've looked at this issue before and this is not calling for anything new." He said the petitioners had "suspicions but no information". "If we continue to allow this to be taken forward, then we're not working in the best interests of those affected," he added. Scottish National Party MSP Sandra White said: "I would agree that the parents at no time have contacted this committee. "What they are looking for now is not so much closure, but a bit of dignity."